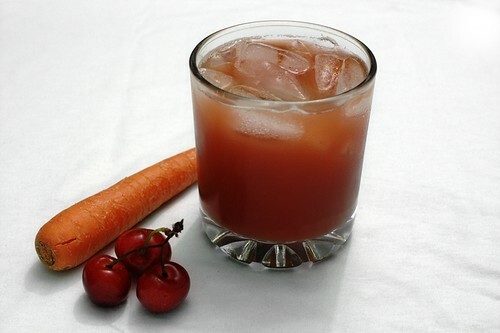 simple cherry and carrot juice, originally uploaded by aarn! +3rd June, 2010+. pitted and removed the stems from 1.5-lbs of fresh cherries. ran the cherries through a hand-crank masticating juicer with a few small peeled and diced raw carrots. used a coarse mesh strainer to remove some of the larger pulp and served in a chilled glass with some ice.